Have an automotive repair shop that is constantly outsourcing your exhaust jobs because you don’t have the right tube bender for the job? If that is the case look, at theEB-300 exhaust bender from Baileigh Industrial. This just might be tool you need to add profitability back to your jobs. The EB-300 comes with everything you need to get started. For bending, the EB-300 exhaust bender comes with standard radius tooling from 1-1/2" up to 3" OD (for 2-1/4 to 3” OD tubing 12 gauge mild steel wall thickness is required). The EB-300 is considered a compression bender as it uses one large hydraulic ram to push the inside radius die into the compression assisted outside counter dies. The outside dies have two hydraulic cylinders that applies pressure at the point of bend on the inside radius die. The end result is that the machine can bend light gauge tubing without folding the material in half. 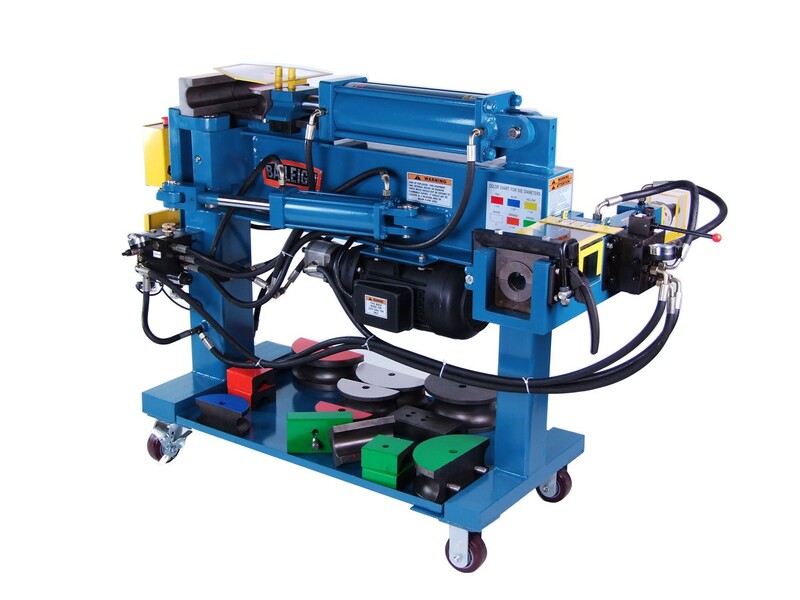 The EB-300 exhaust pipe bender requires 220 volts of single phase power is operated using knee controls, allowing hands to be kept free for material control. This exhaust bender also comes equipped with tube end forming station. This station includes tooling to expand, flare and swage the tubing. It also allows the operator to create ball joints and flanges. The EB-300 exhaust bender comes filled with hydraulic fluid and has an oil sight glass to ensure the proper level is maintained at all times. A useful tooling tray is standard as well so the tooling stays with the machine instead of getting lost in a busy auto shop.